The Allendale Street Neighborhood Crime Watch group. The officer on the left is Sgt. Eric Krause, and on the right is Lt. Michael Kern, both from E-13 District. What a tangled web we've woven! The Internet has become something of a cyber smorgasbord with seemingly unlimited options for people to connect with others who share similar interests. Selections include Facebook, MySpace, Blogster, and Xanga, as well as search engines such as Google and Yahoo, which allow members to exchange photos, chat, and participate on discussion boards. Most sites allow special interest groups to create forums in which members can conduct business meetings online. Unfortunately, as these networks expand and multiply independently, group members often have difficulty finding and uniting fellow participants in one location. As a result, many organizations, such as the Boston Police Department (BPD) Neighborhood Crime Watch Unit, are developing their own private, centralized networks. 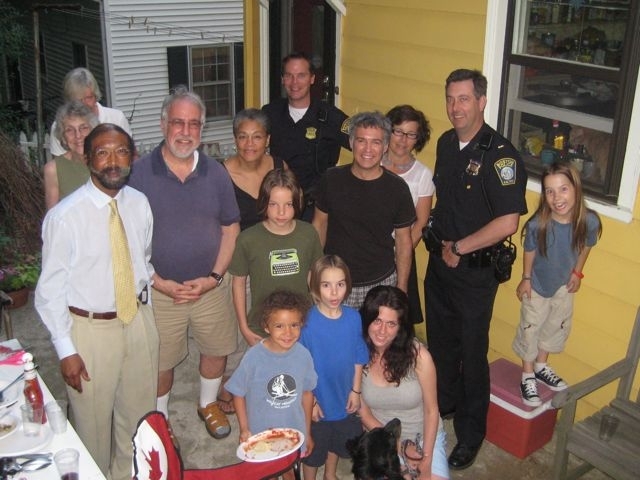 This past April, the BPD launched a pilot program called the E-13/Jamaica Plain Neighbors Network. This online network will provide residents of Boston 's Jamaica Plain neighborhood with organizational and communication tools, allowing them to learn about and take advantage of police, city, and community resources in order to combat crime. While the network is still in the evaluation phase, Jamaica Plain law enforcement officials are enthusiastic: “This is a powerful community policing outreach and engagement tool,” said Captain Christine Michalosky, Boston Police Commander of District 13. “We are excited about increasing communication and participation between the police and community in a fun and casual manner.” After testing is completed, the BPD plans to begin efforts to expand the network and integrate other neighborhoods within greater Boston. Established in 1985, the Boston Neighborhood Crime Watch Program now comprises nearly 700 active groups, and program leaders have trained more than 100,000 citizens. The program had enjoyed slow and steady “block-by-block” growth for nearly two decades when a unique opportunity presented itself in 2006. That year, the residents of historic Charlestown, the second-oldest neighborhood in Boston and home to approximately 15,000 people, expressed interest in organizing the entire neighborhood into a community crime watch network. The BPD Neighborhood Crime Watch Unit responded by working with Charlestown resident volunteers and A-1 District police to organize what became known as the Coalition Organizing Model. Coalition participants provided crime prevention training to more than 500 residents and held rallies to generate interest in Neighborhood Crime Watch, which led to the creation of some 50 new Charlestown watch groups. These efforts resulted in a 16 percent overall reduction in crime in the Charlestown community. As the Boston Neighborhood Crime Watch Program mushroomed and criminal activity decreased, the Police Department realized it was facing a new challenge—how to maintain the momentum needed to expand further and provide current watch volunteers with the crime prevention tools they needed to succeed with a staff of only three BPD employees. Past experience had shown that, over time, crime prevention groups disintegrate as members move away, priories shift, and leadership changes. Also, in large communities such as Boston, intergroup communication and collaboration are typically rare. Crime watch groups usually work independently, in isolation from neighboring groups, community service offices, and law enforcement, and members often do not know each other or have the means to share vital information. In order to strengthen the Neighborhood Crime Watch Program and ensure its continued success, the BPD determined that program members required access to a centralized source for crime prevention tools, maps, and news. Furthermore, they needed a forum in which to interact with members of other watch groups and community leaders. To development this ambitious product, the BPD researched within the Boston Neighborhood Crime Watch community and found the answer from a seasoned volunteer with network design experience. After he joined the BPD, Porcelli collaborated with fellow members of the Neighborhood Crime Watch Unit team to design a network that incorporated law enforcement and crime prevention functions with social features of his previous project while supporting and sustaining the tremendous momentum generated by the Coalition Organizing Model. The goal of this network was clear-cut: to build community and reduce crime by connecting neighbors to each other and to community and police resources. The resulting E-13 Jamaica Plain Neighbors Network comprises 11 “cluster groups” of streets representing the sections of neighborhoods within the E-13 Jamaica Plain District. In addition, streets groups have been set up for those groups that have indicated they would like a street-level group. Over the next couple of months, street groups will be created as new Neighborhood Crime Watch groups come online and existing groups join the network. A screen shot of the Neighborhood Crime Watch group maps featured on the Neighbors Network homepage. 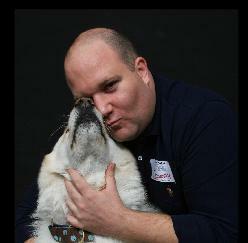 Porcelli built the Jamaica Plain Neighbors Network using Ning, a platform that allows developers to combine and customize features such as video, weblogs (“blogs”), forums within the cluster and street groups, photographs, and event calendars. “The message we consistently hear from the Neighborhood Crime Watch leaders and members across the city is that they want tools to help them meet and engage their neighbors,” Porcelli said. “ The Neighbors Network builds on a cornerstone Watch concept—neighbor interaction.” Like other social networks, the Neighbors Network allows members to email each other, create and customize personal pages, make friends with fellow members, and create blogs with content ranging from diaries to community notices. Current posts include an announcement regarding volunteer opportunities at an upcoming National Night Out event and a blog from the District 13 police unit regarding expansion of its bicycle policing activities. The social network also serves as a centralized organizational and communication tool. Cluster groups provide members with a discussion board and administrators with the ability to manage group membership. Street group boards incorporate similar features and may be accessed only by their members. The Ning platform enables users to embed videos, photographs, and pod casts from outside media sources such as the Citizen Observer and BPD News . Members also can embed network widgets (“promotion boxes”) on their personal pages and other social networks to which they may belong. Identifying user needs and customizing the platform to meet these needs proved to be the greatest challenge to designing the network structure. “Since this had not been done before, we had to figure out how to marry the functionality to our needs—which we've been discovering as we proceed,” Porcelli said. Another challenge involved convincing groups already using other networks such as Yahoo and Google to switch to the new system. Porcelli noted that almost all have agreed to make the switch after having been made aware of the benefits of a central neighborhood network. “We found that we needed to shift member focus from their street to their neighborhood. The Neighbors Network makes it easier for neighbors to find and join their group online, and it gives leaders access to each other and neighboring groups, which makes collaboration possible,” he explained. Although launch of the Neighbors Network was just announced in April, 420 new members have already joined. 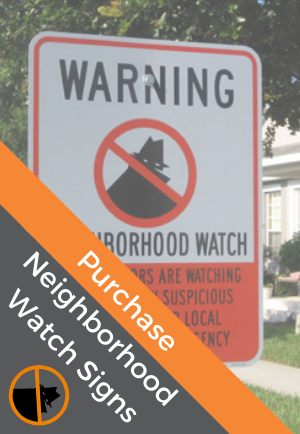 To further boost membership, the Neighborhood Crime Watch Unit has planned a campaign to publicize the network by posting flyers in every building in Jamaica Plain, providing information during Neighborhood Crime Watch group and homeowners association meetings, hosting network “how-to” classes, and encouraging members to invite their neighbors to join. Early response from network members has been overwhelmingly positive. “Based on the initial feedback we have received, we think we've hit a home run,” Porcelli said. “Members of the network have made comments such as ‘This is a wonderful tool' and ‘Makes crime watch fun. '” The convenience of 24-hour network access is attracting many new members; in fact, more than half of all those signed up to participate had never taken part in neighborhood crime prevention prior to the launch of the Neighbors Network.